Are you beginning a search for a new quartz crystal oscillator for your application? 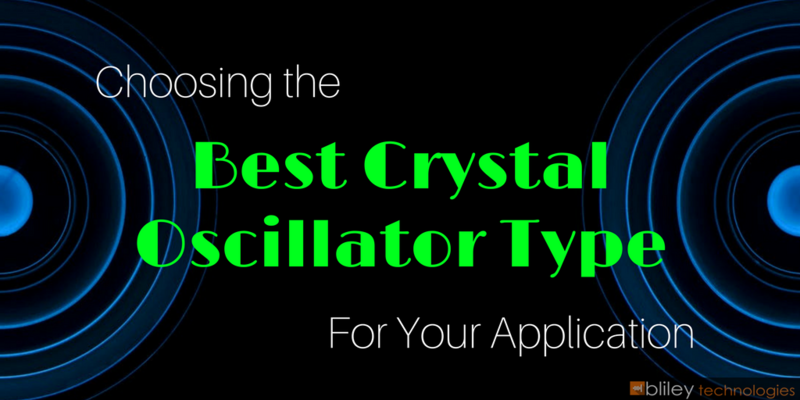 Of course, it's not always simple selecting the best crystal oscillator. There's a handful of different oscillator types to choose from including OCXOs, TCXOs, VCXOs, and clock oscillators. But, hold up! We're about to make things a whole lot easier for you. You're going to learn the basic descriptions of operating qualities and limitations of each type of crystal oscillator. If you find an oscillator type that sounds like it may be a good fit for your application, follow the link for more related details and products related to that specific oscillator type. It's that easy! Ok, that should do for a good intro...lets get to it! The OCXO is an oscillator which is temperature controlled (ovenized crystal controlled oscillator). This type of oscillator has a temperature controlling circuit to maintain the crystal and key components at a constant temperature. OCXOs are typically used when temperature stabilities on the order of ±1 x 10-8 or better are required. While this type of oscillator has a tenfold improvement over a TCXO for temperature stability, the OCXO tends to be higher in price and consumes more power. Typical power at +25°C ambient is 1.5 Watts to 2.0 Watts in a steady state condition. The key to an OCXO is to keep the crystal and some of the other oscillator components at one temperature while the outside ambient temperature changes. This can be related to a house in winter, where a thermostat located inside the house senses a temperature change, and controls the furnace to maintain a desired temperature. What is the desired temperature of operation? The temperature of operation is one of the crystal's turning points (refer to crystal section). At the turning point, the slope of the frequency versus temperature curve is zero. This means that even if the temperature varies up or down slightly, the frequency change is minimal. Note that for an OCXO, the turning point temperature of a crystal must be higher than the upper limit of your temperature range. This is because you could not control a house's temperature at +25°C with a furnace if the outside temperature is +35°C. 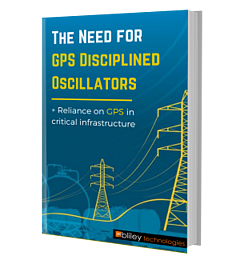 A general rule of thumb is that you will need the turning point of the crystal to be 10°C higher than the upper operating temperature of the OCXO oscillator circuit. For an OCXO, the thermistor (described in the TCXO section) is equivalent to the thermostat in the house. It is used to sense the temperature of the crystal and crystal oscillator circuitry. The heat source can be either a power transistor or a power resistor. The last component required is a comparator circuit that is used to control the amount of power generated in the heat source. This comparator circuit consists of an op-amp and other components (resistors and capacitors) configured as a high gain amplifier. The temperature of operation is called the set point and is adjusted by a selected value resistor chosen during the normal production process. During normal operation, the thermistor senses an ambient temperature change by changing to a slightly different resistance value. The comparator circuit then adjusts the power generated to return the thermistor back to the original resistance value and the crystal and circuit temperature to the original set point temperature. OCXOs use insulation in a fashion similar to a house. Insulation is used to lessen the effects of ambient temperature changes and to reduce the amount of power required to maintain the set point temperature. The better the insulation used, the less power is required to stay at the set point temperature. The temperature controller circuit of a typical OCXO will hold the set point temperature within ±1°C or less. The temperature stability for a typical OCXO ranges from ±1 x 10-7 to ±1 x 10-9. If tighter stabilities (±1 x 10-10 to ±5 x 10-11) are required, what is known as a double oven oscillator will be required. This is made by putting an OCXO inside another oven package. This outer oven will buffer the OCXO from ambient changes and the combination of two temperature controllers can hold the set point temperature to within ±0.10°C. This type of oscillator requires a larger package, consumes more power, and has a higher price. Typical power for a double oven oscillator at +25°C ambient is 3.0 Watts to 4.0 Watts in a steady state condition. Because OCXOs have aging rates of 0.20 ppm/year to 2.0 x 10-8/year, there is a need to adjust the frequency at +25°C to offset aging effects. 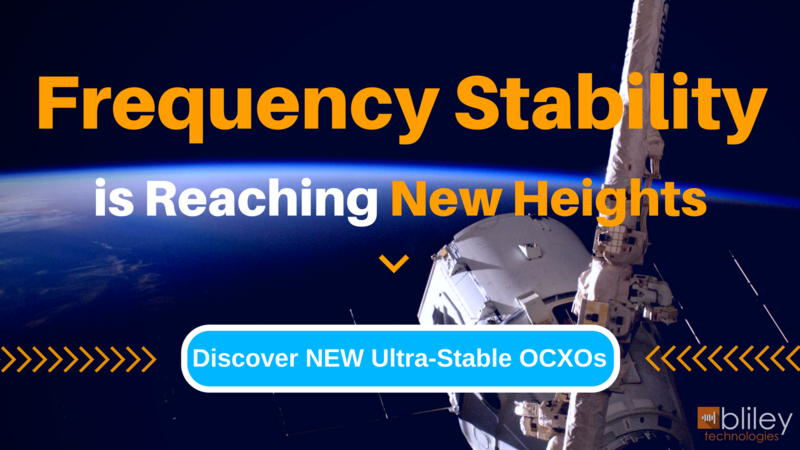 Most OCXOs have mechanical frequency adjust similar to TCXO oscillators. The typical adjust range is +2 ppm to ±0.20 ppm. The type of crystal cut will also add to the stability of the oscillator. Some types of cuts have different slopes of frequency versus temperature at their turning points. For example the SC type crystal might have a slope of 5 x 10--9/°C for a +80°C turning point while an AT-type crystal might have a slope of 1 x 10-8/°C for an 80°C turning point. With the same temperature controller, the AT-type crystal will change frequency two times the amount of the SC-type crystal. Temperature stability and operating temperature range will dictate the crystal type used. A TCXO is a temperature compensated crystal oscillator. The basic building block for a TCXO is a VCXO with approximately ±50 ppm deviation range and a temperature sensitive network. This temperature sensitive network (temperature compensation circuit) applies a voltage to the varactor diode that corrects the frequency of the VCXO at any temperature within the operating temperature range. Typical temperature stabilities achieved from TCXOs would be from ±0.20 ppm to ±2.0 ppm. From this we can see that a TCXO offers about a tenfold improvement in temperature stability over a clock oscillator. To create a temperature compensation circuit, we need something to sense ambient temperature. A thermistor is the typical sensing device in most TCXOs. Thermistors are resistive devices whose resistance is dependent upon the ambient temperature. There are two types of thermistors, ones that have a positive coefficient, which means that their resistance goes up as temperature goes up and negative coefficient thermistors whose resistance goes down as the temperature increases. Typical temperature compensation circuits combine thermistors and resistors into a voltage divider network to produce the required correction voltage at any temperature. This correction voltage is applied to the varactor. If the temperature-compensation circuit matched a crystal's temperature curve exactly, the oscillator's frequency would remain constant as the temperature changed. This is not obtainable in the real world because of the variability of crystals available and the thermistor coefficients available. Each crystal's temperature stability varies slightly, and the exact thermistor coefficients and values to produce a perfect network area not always available. Typically given sets of thermistors are used for all TCXOs in a production lot. This will allow most TCXOs to be corrected to an acceptable stability. If a tighter temperature stability is required, the thermistor can be adjusted during the production sequence, but the cost of the TCXO will increase because of higher test times. The other major problem to overcome is the perturbations (deviations from curve fit data) in the crystal temperature stability. These deviations from the smooth temperature curve are difficult to compensate for, and if they are of a narrow duration, impossible to compensate for. If the temperature stability requirement for a TCXO is too tight, some crystals might have to be replaced and production testing started over. This will increase the cost of the TCXO. Because TCXOs have aging rates of 0.50 ppm/year to 2.0 ppm/year, there is a need to adjust the frequency at +25°C to offset aging effects. Most TCXOs have mechanical frequency adjust similar to clock oscillators. The typical adjust range is ±5 ppm. A VCXO (Voltage-Controlled Crystal Oscillator) is a crystal oscillator with a frequency that can be adjusted by an externally applied voltage. VCXOs have a wide variety of applications in frequency modulation (FM) and phase-locked-loop (PLL) systems. Typical deviation ranges can be ±10 ppm to as much as ±2000 ppm. The device that allows a crystal oscillator's frequency to be voltage controlled is known as a varactor diode. This device is essentially a voltage variable capacitor. The capacitance of a varactor diode is inversely proportional to the voltage applied. To understand how a diode can be a voltage variable capacitor, first consider what is a capacitor. It is made of two oppositely charged plates separated by a dielectric. The diode is nothing more than a P-N silicon junction. The facing edges of the two regions act as plates. Reversed-bias forces charges to move away from their normal regions and form a depletion layer. The greater the voltage, the wider the depletion layer, which increases the distance between the plates, which decreases the capacitance. To get larger tuning ranges, some varactors have a hyper-abrupt junction. The doping in a hyper-abrupt varactor is denser near the junction, which causes the depletion layer to be narrower, and the capacitance to be larger. Therefore, changes in reverse voltage have greater effects on capacitance. The transfer function or slope polarity for a VCXO is the direction of frequency change versus control voltage. This can either be positive, meaning a positive change in voltage will cause the frequency to go higher or it can be negative, meaning a negative change in voltage will cause the frequency to go higher. This parameter needs to be specified or some slope will be assumed by the manufacturer. The temperature stability of a ±25 ppm deviation VCXO might be ±10 ppm over 0°C to +50°C, with a yearly aging rate of ±1 ppm. The temperature stability of a ±1000 ppm deviation VCXO might be ±100 ppm over 0°C to +50°C, with a yearly aging rate of ±5 ppm. The crystal controlled clock oscillator (XO) is a device that achieves its temperature stability from the quartz crystal's inherent temperature stability (see also crystal oscillator). This characteristic is typically specified in tens of parts per million (ppm). The initial accuracy at room temperature (+25°C) is dictated by the calibration of the crystal for the most part. A typical calibration tolerance for an AT crystal would be ±10 ppm. A frequency adjustment electronic circuit could be incorporated so that the nominal frequency at room temperature could be adjusted for aging. This frequency adjustment would be achieved by use of a trimmer capacitor and the typical adjustment range would be ±10 ppm to ±20 ppm. With this type of adjustment the frequency at +25°C could be set to ±1 ppm typically.